A handy all-in-one reference and decal package for those who have several Tornado kits to build or as a group buy. Should also appeal to decal collectors because of the attractive high quality format. Relatively expensive if all you want is decals for one or two models. No decals for the Tiger-scheme tail fin. Mark 1 Ltd’s “Dozen Set” Colours & Markings format is well-established and familiar to many. 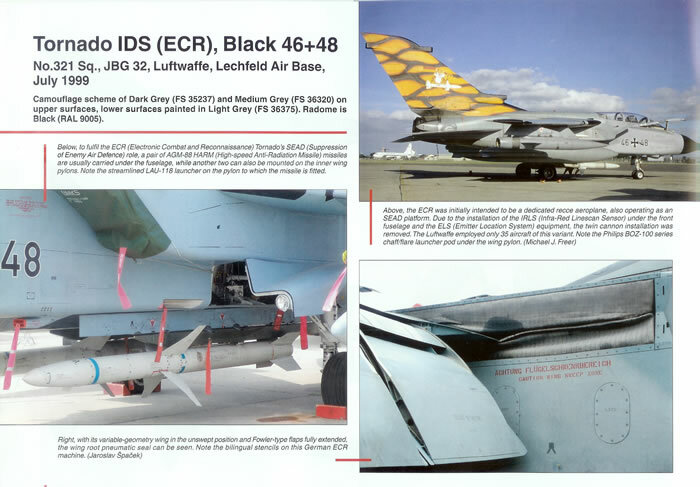 The format consists of a very nicely produced A4 landscape booklet and decals for a dozen different aircraft of the type covered. It has an attractive front cover, whilst the rear cover has colour profiles of the 12 schemes the booklet provides colour plans and decals for. 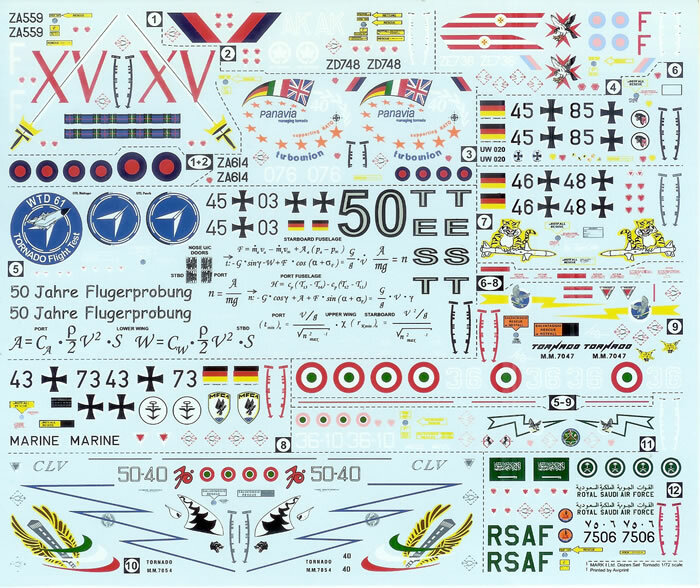 Decals for the schemes are available in different scales to suit commonly available kits of the subject (so make sure you order the correct product code for your chosen scale). Inside consists of two pages dedicated to each of the 12 colour schemes. The first page for each set of markings has a photograph of the subject scheme and some brief notes concerning its background. 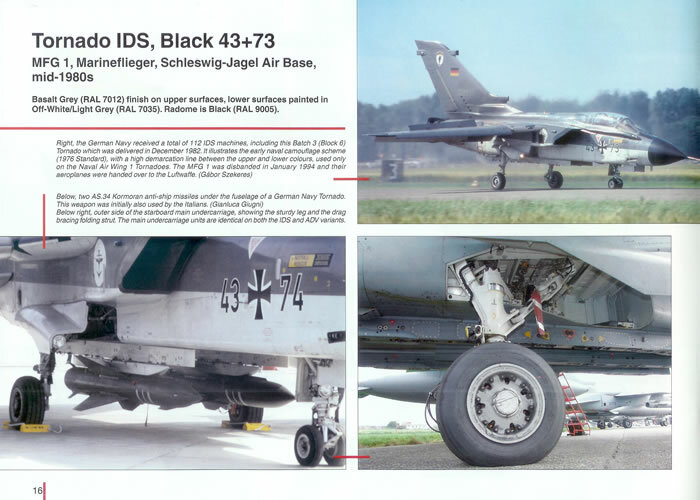 Also on this same page are walk-around photos of service aircraft. The second page on each scheme has clearly printed and attractive 4-view colour plans. 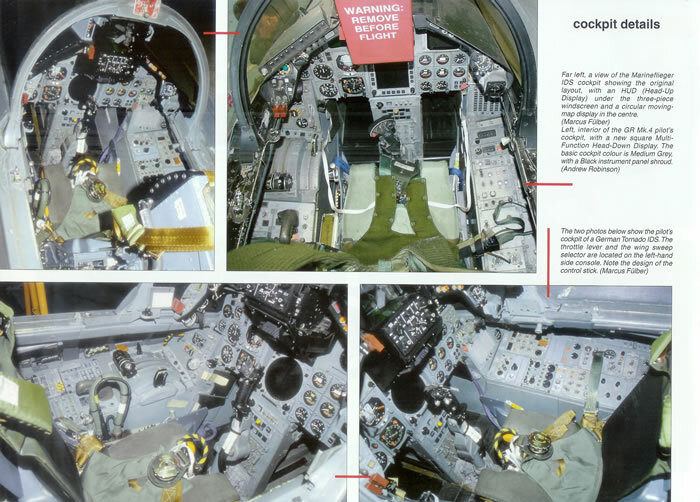 The last three pages of the book have clear colour close-up photos of the both GR Mk.4 and F Mk.3 cockpits. 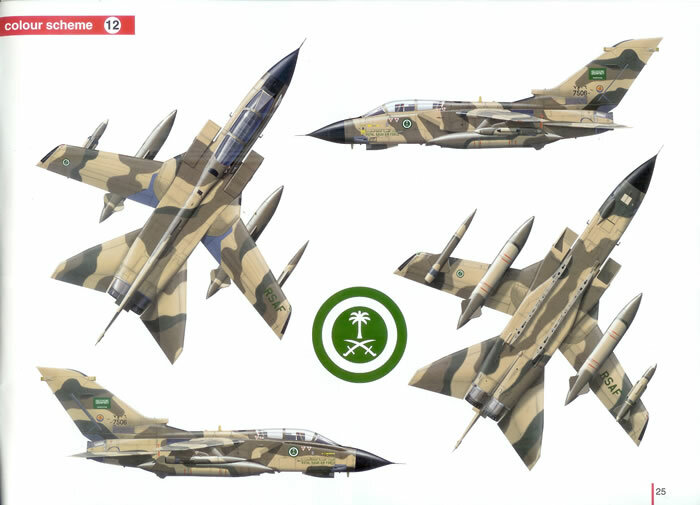 The 12 schemes offered are for the RAF (two GR MK.1, GR MK.4 & F Mk.3), Luftwaffe (IDS & IDS [Recce] & IDS [ECR]), Marineflieger (IDS), Italian Air Force (IDS, IDS [ECR] & ADV) and Royal Saudi Air Force (IDS). In each case the decals are beautifully printed. I do think that many modellers would have liked to have decals for the Tiger tail of the option number 7, a Luftwaffe IDS [ECR], rather than having to paint them. However this would need two large decals that would presumably add expense and would not necessarily be a perfect fit for all the various brands of Tornado kits. This said, I’m inclined to think it should have been provided. The quality and attractiveness of production this “dozen set” is plain to see. 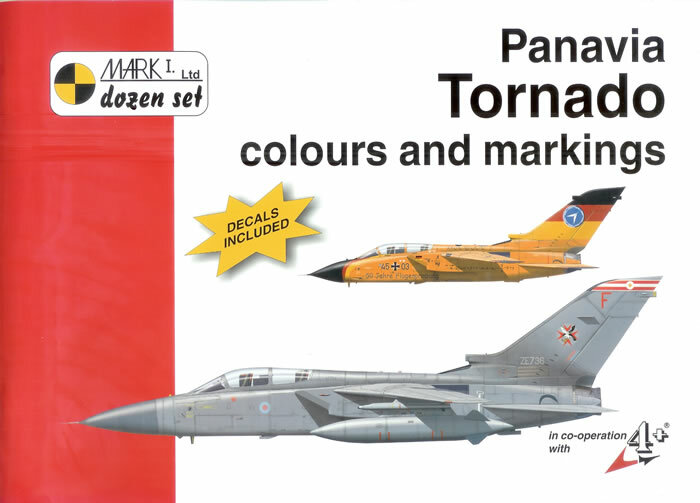 Its appeal and value will no doubt lie with those who want a simple all-in-one decals and reference package to finish their Tornado model. 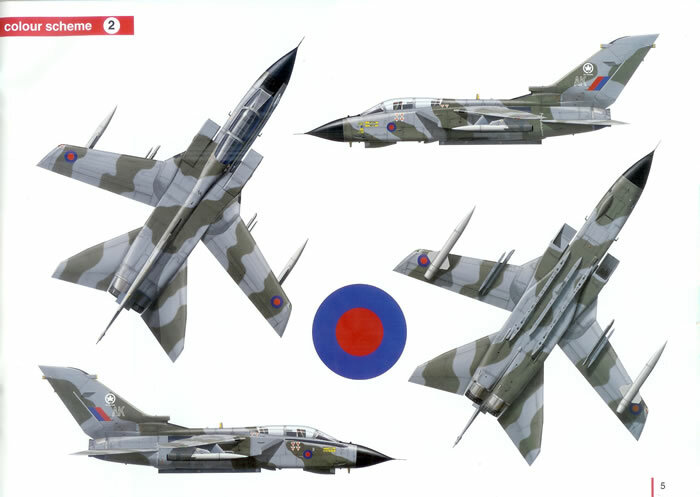 I suspect that decal collectors will also be tempted where this “deluxe” combination of decals, colour plans and photos. The package is not the cheapest solution to decaling your Tornado, but to be fair the price is comparable to other premium presentations of decal packages. 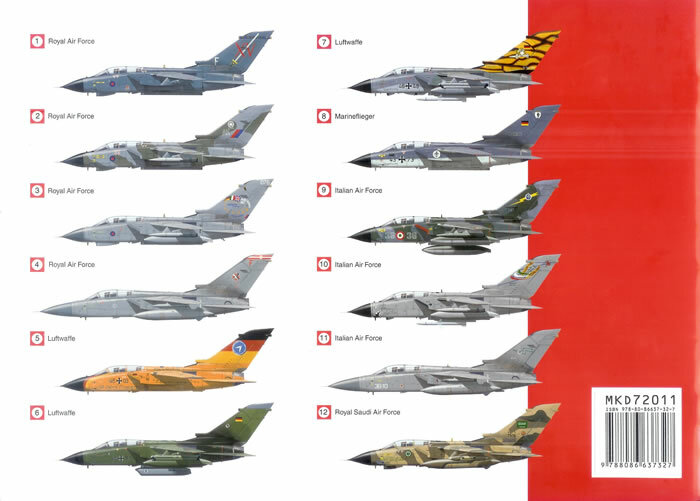 TMark 1’s Panavia Tornado “dozen set” is an ideal solution for modellers who want an all-in-one reference and decals. They will be able to complete their Tornado kits in attractive schemes supported by photos, and may want to exploit the walk around to add more detail to their finished model.